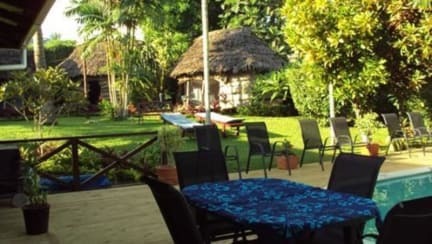 The Samoan Outrigger Hotel is without doubt the most popular budget hotel in Samoa. Why? Because the Samoan Outrigger Hotel has gained a reliable reputation for offering clean and affordable accommodation. 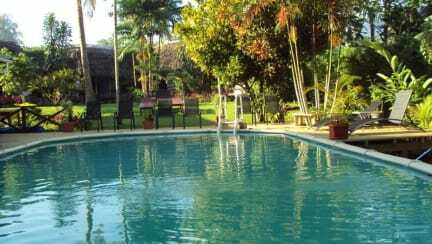 A place where you can enjoy a relaxed atmosphere and have all the facilities needed by todays discerning travelers. The Samoan Outrigger hotel is located on the Cross Island Road. Only 15 minutes walk from downtown Apia. 5 minutes walk from the National hospital. The Samoan Outrigger Hotel offers a wide range of accommodation. At the Outrigger you will find single/double/triple rooms with ensuite and shared facilities, depending on your choice. For the budget conscious traveler we also have traditional Samoan garden fales, overlooking the tropical garden and swimming pool. All fales are equipped with Samoan hand woven mats, mosquito nets, mattress and linen. All fales have electricity installed. If you are looking for more up market rooms we can offer single/double rooms with ensuite facilities and air-conditioning. All rooms have private external patio area, TV, telephone, mini fridge, tea/coffee facilities.